Inpsired by Elizabeth Zimmermann’s Nether Garments from the Knitter’s Almanac, this is a pattern for guys and girls who love to show off their gams in short shorts. There’s not much else to say about these because they‘re simple and comfortable. Sometimes that’s all you need. Shorter needle is used for legs, longer needle is used for body. C6B: Slip next 3 sts to cable needle and hold to back of work; k3 from left needle, k3 from cable needle. C6F: Slip next 3 sts to cable needle and hold to front of work; k3 from left needle, k3 from cable needle. Two variations on the cable panel are given. On the men's shorts shown, the rope cables flanking the center cable rotate inwards; on the women's shorts, they rotate outwards. 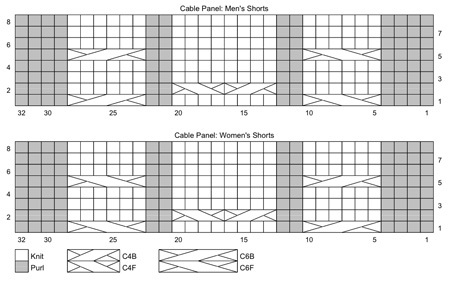 Either cable panel may be used for both men's and women's shorts. Round 1: P4, C6F, p2, k8, p2, C6B, p4. Round 2: P4, k6, p2, C4B, C4F, p2, k6, p4. Round 3: P4, k6, p2, k8, p2, k6, p4. Round 4: Work as for Round 3. Round 5: Work as for Round 1. Rounds 6-8: Work as for Round 3. Round 1: P4, C6B, p2, k8, p2, C6F, p4. Knit to wrapped stitch. Slip next stitch from left needle to right needle, use tip of left needle to pick up "wrap" and place it on right needle, insert left needle into both wrap and stitch, and knit them together. Using shorter needle and MC, CO 94[101, 115, 125, 140] / 108[121, 133, 152, 164] sts. Place marker and join to begin working in the round, being careful not to twist. Work in stockinette st until work measures 3[3.5, 4, 4.5, 5] inches or desired inseam length. Place first 10[12, 15, 18, 23] / 18[21, 23, 32, 34] sts of next round on waste yarn. Transfer remaining 84[89, 100, 107, 117] / 90[100, 110, 120, 130] sts to spare needle(s). Using shorter needle and MC, CO 104[111, 125, 135, 150] / 118[131, 143, 162, 174] sts. Place marker and join to begin working in the round, being careful not to twist. Set-up Round: K43[47, 55, 59, 66] / 48[55, 62, 69, 76], place marker, work Round 1 of Cable Panel, place marker, k29[32, 38, 44, 52] / 38[44, 49, 61, 66]. This round establishes pattern for left leg. Continue in pattern until work measures 3[3.5, 4, 4.5, 5] inches or desired inseam length. Break yarn. Place last 10[12, 15, 18, 23] / 18[21, 23, 32, 34] sts of last round worked on waste yarn. 94[99, 110, 117, 127] / 100[110, 120, 130, 140] sts remain. Do not break yarn. Using longer needle, work sts of left leg in pattern, place marker to indicate center front, k sts of right leg, place maker to indicate center back, join to work in the round. 178[188, 210, 224, 244] / 190[210, 230, 250, 270] sts. Work 10 rounds in pattern. Decrease Round: K2tog, work in pattern to 2 sts before center front marker, ssk, slip marker, k2tog, k to 2 sts before center back marker, ssk. 4 sts decreased. Work 2 rounds in pattern. Repeat these 3 rounds 7 times more, then work Decrease Round once more. 142[152, 174, 188, 208] / 154[174, 194, 214, 234] sts. Work 0[0, 7, 14, 14] rounds in pattern. Slip sts to waste yarn and try on shorts. Before proceeding, body section of shorts should be 2.25 inches shorter than desired length to top of waistband, in front only (back will still be too short at this point). Adjust length if needed. Back waist is raised using short rows. As written, back waist will be approx. 4.25[4.5, 5.5, 6, 6.5] / [3, 3.75, 4.25, 5, 5.5] inches higher than front waist.It's a good idea to try shorts on periodically while working short rows; you may find that you need more or fewer short rows to make shorts fit you perfectly. Ideally, short rows will raise back waist to 2.25 inches less than desired length to top of waistband. Note that when short rows are turned within cable panel, the turning points are worked every 3 sts instead of every 2 sts. If a cable twist falls at the same point as a short row turning (W&T), omit the cable twist. Row 1 [RS]: K34[38, 46, 50, 57] (to beginning of cable panel), work first 15 sts of cable panel in pattern, W&T. Row 2 [WS]: Work in pattern to center back marker, p44[48, 56, 60, 67], W&T. Row 3 [RS]: Work in pattern to 3 sts before previous wrapped st, W&T. Row 4 [WS]: Work in pattern to 2 sts before previous wrapped st, W&T. Repeat Rows 3-4 four times more. 68[76, 92, 100, 114] sts across back between last two wrapped sts. Row 1 [RS]: K39[46, 53, 60, 67] (to beginning of cable panel), W&T. Row 2 [WS]: P78[92, 106, 120, 134], W&T. Next Row [RS]: K to 2 sts before previous wrapped st, W&T. Next Row [WS]: P to 2 sts before previous wrapped st, W&T. Repeat these 2 rows 8[9, 12, 14, 16] / 9[12, 14, 16, 18] times more. 32[36, 40, 40, 46] / 38[40, 46, 52, 58] sts across back between last two wrapped sts. K to center back marker, then work 1 round in pattern, working wraps together with wrapped sts. Next Round: [K8, k2tog] 3[3, 4, 5, 5] / 3[4, 5, 6, 6] times, k4[8, 6, 0, 7] / 9[6, 3, 0, 7], remove marker at beginning of cable panel, k2tog, [k1, k2tog] 10 times, remove marker at end of cable panel, [k8, k2tog] 7[8, 9, 10, 11] / 8[9, 10, 12, 13] times, k6[2, 6, 6, 9] / 3[6, 9, 2, 5]. 121[130, 150, 162, 181] / 132[150, 168, 185, 204] sts. Work 14 rounds in 2x2 Rib, evenly decreasing 1[2, 2, 2, 1] / 0[2, 0, 1, 0] sts in first round. 120[128, 148, 160, 180] / 132[148, 168, 184, 204] sts. Using shorter needle and CC, with RS facing and beginning at center of inner leg, pick up and k 1 st in each CO st around lower edge of right leg. Place marker and join to beging working in the round. 94[101, 115, 125, 140] / 108[121, 133, 152, 164] sts. Round 1: [K8, k2tog] 9[10, 11, 12, 14] / 10[12, 13, 15, 16] times, k4[1, 5, 5, 0] / 8[1, 3, 2, 4]. 85[91, 104, 113, 126] / 98[109, 120, 137, 148] sts. Round 2: P all sts. Repeat Rounds 2-3 once more. Loosely BO all sts purlwise. Pick up sts around lower edge of left leg in the same way as for right leg. 104[111, 125, 135, 150] / 118[131, 143, 162, 174] sts. Round 1: [K8, k2tog] 10[11, 12, 13, 15] / 11[13, 14, 16, 17] times, k4[1, 5, 5, 0] / 8[1, 3, 2, 4]. 94[100, 113, 122, 135] / 107[118, 129, 146, 157] sts. Continue as for right leg. Weave in ends. Graft held sts together at crotch, leaving long tails of yarn at beginning and end to sew up any holes. 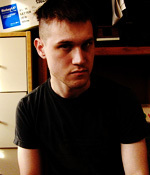 Craig Hunter is a very busy young knitwear and t-shirt designer based in NYC. He loves avant-garde yet subtle and practical design. His knitwear icons are Sandra Backlund and Elizabeth Zimmermann. He is an advocate for machine knitting. And he runs CUBISTLITERATURE.COM.